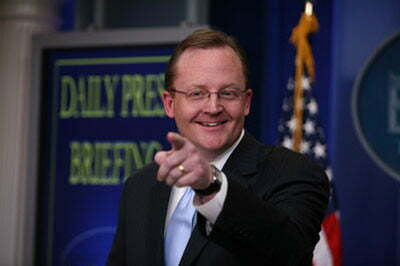 Former White House press secretary Robert Gibbs may soon be headed to Facebook as a senior communications official for the social network giant, reports The New York Times‘ Dealbook blog. The rumored high-profile hiring comes via “people briefed on the negotiations,” and has been confirmed by neither Facebook nor Gibbs. The alleged conversations between Gibbs’ camp and Facebook come prior to a public offering by Facebook that is said to be planned for 2012. Gibbs, who served under President Obama for two years before resigning in February, may opt to wait to jump into the private sector, and instead help build up Obama’s re-election campaign, sources say. It’s easy to see why the lure of a job with Facebook could overpower the pull of politics: Gibbs would likely make millions of dollars with the Palo Alto, California, company. According to The New York Times‘ sources, Gibbs is vying to receive both a cash salary as well as shares in the company, which has been valued at around $65 billion. When Facebook goes public, some say it could be history’s largest stock offering. With around 600 million users worldwide, Facebook would also give Gibbs a wider direct audience than would the President, who has a mere 308.7 million constituents who make up the US population. Because of both pressure to shed the negative light shown on the company by Oscar-nominated film The Social Network, as well as increased pressure from Congress and federal regulators over privacy and security issues, Gibbs would serve many purposes for Facebook, as both a seasoned PR man and a Washington insider. Gibbs also served as one of the architects of Obama’s historic presidential bid in 2008, which was greatly helped by the enthusiasm of the Facebook generation and the viral marketing qualities inherent in the online world. If hired, Gibbs would serve under Facebook vice president for global communications Elliot Schrage, who came to the company from Google in 2008. Other potential Gibbs job offers reportedly include chairman of the Democratic National Committee.